Now that we are in a new neighborhood we are trying to fit in amongst our new neighbors. We shoveled our driveway and sidewalks during the snow alongside our neighbors and we've been trying to keep our front yard tidy so as not to be a blight among the other homes. Next, we'll be composting. Well, sort of composting. Our neighborhood is part of a pilot program in NYC. Essentially, the city will pick up organics (stuff that can be composted) once a week as long as we put it in a special brown bin distributed by the city. You can also put yard debris (leaves, soil, etc) in those bins and the city will take them as well since that's also in scope as far as compost goes. I really love the idea of not contributing to landfills but, I'll be honest here, I was pretty scared of trying this out. I've had weird trash problems in the past (read: maggots in your trash bin — no fun!) and so I wanted to make sure I had a good system to avoid any smell or pest problems. I solicited advice from my Facebook friends thinking maybe one or two might have some insights. I was shocked to see so many folks with advice on how to collect compostable material or even actually do the composting yourself. This went a long way to making me feel comfortable really getting started in creating a routine for our household that might actually work! My Compost Bin – pretty cute, huh? I bought a compost container for the kitchen. This is just a little bin that sits on the kitchen counter. I placed it closer to the trash we currently have so it shouldn't be too strange to simply put organic materials in there versus in the big trash can. This little container is super cute and kind of recedes into the background a little bit so I don't mind it even though I'm one of those people who prefers not to have a million things out on the counter. I also bought a ton of green, compostable bags. I bought bags to line this little bin (I opted for 2.6 gallon bags which are teeny tiny and fit the bin pretty well) and I also bought bags to line the brown bin that sits outside our house. I don't want that bin to get gross. When we moved into the house, it was gross. 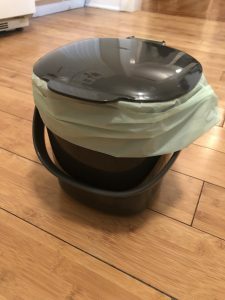 There was a black bag in it with some sort of organic material left behind by the seller (eww) and thankfully the Department of Sanitation took that grossness away and let me with a nice clean bin — and I want to keep it that way, thus the liners. Those liners are about 13 gallons. And, now that the bin is on the kitchen counter, I've started using it. So far, I've only been putting in used loose tea leaves in it and some food soiled napkins. We've been really bad about cooking at home lately (it's been a little crazy) but when we do, it should be pretty trivial to put food trash into the bin. Also, we have a drain catcher thing in our kitchen sink which collects any big pieces of food scraps that would otherwise clog our drains. I've now started to empty that container straight into the compost bin. Composting is Easy – hopefully not jinxing myself! It's only day one, but this is really easy! Once the bag on the kitchen counter gets full, I'm thinking I will tie it up and put it into my outside brown bin. As the weather is starting to warm up, we'll have to see how that works out. Many of my friends tend to freeze their bags and then bring them to a collection site. I'm not sure if we'll need to freeze before collection day (our collection day is Wednesday) but I think we'll give it a try and see how it turns out. 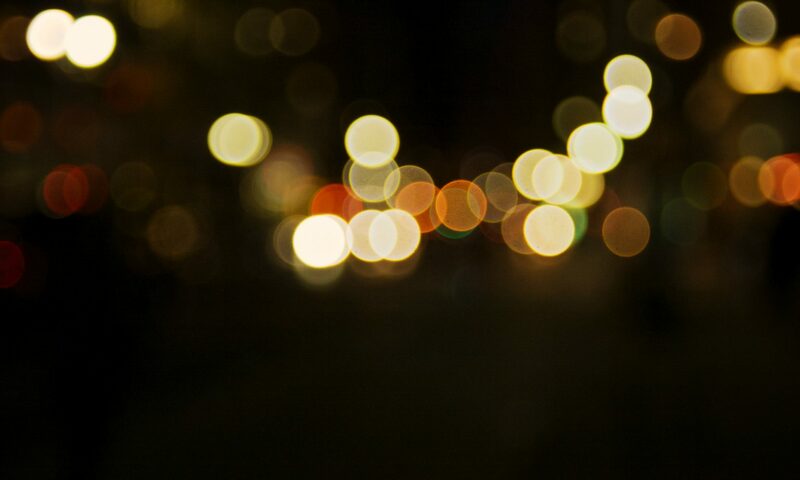 I will continue to update the blog with more information as I get more comfortable with this. I'm hoping this works out and that I can share more about how we make this work in our home. What is the difference between composting and recycling? Recycling is all about re-using stuff in some way so you decrease the amount of junk that ends up in a landfill. 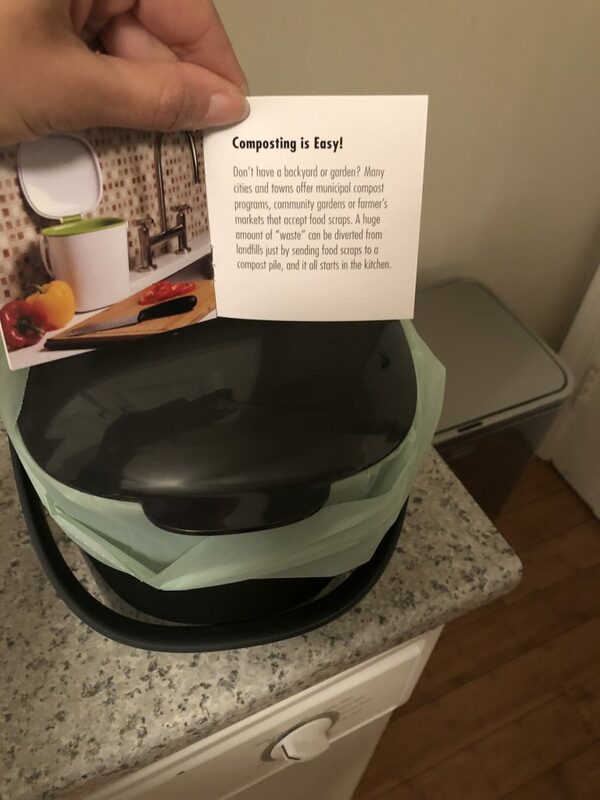 Composting is part of that because with composting you take food scraps and other waste and let it decompose into something that is good fertilizer so you can then re-use it that way. Sanitation Dept in our neighborhood collects stuff that can be composted and they process it (i.e. decompose it) so all I need to do is put most of my smelly food-related trash in a separate bin.